Attention Caesar salad lovers. 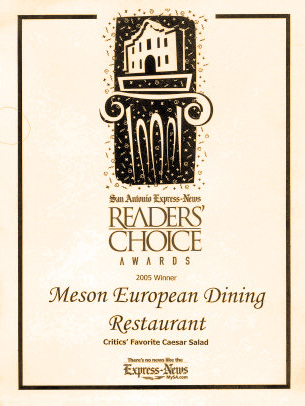 You won’t find a better example of this, the object of your affection, at any restaurant in town than the one being served at Mesón European Dining. That’s because the folks at Mesón know what a caesar really is. It is not, as most restaurants would have us believe, a bunch of Romaine lettuce buried under some creamy, unidentifiable glop and sprinkled with dried Parmesan cheese food. Rather, it is a regal mixture of anchovies, garlic, olive oil, egg yolk, Worcestershire sauce and vinegar that demands to be mixed fresh and tossed with Romaine, croutons and just-grated Parmesan. At Mesón, the whole thing is tossed up table side with an unorthodoxed, but not unwelcome, splash of Tabasco to add a little kick and another layer of flavor. And no laurel rested easier on Caesar’s pate than the freshly cracked black pepper that crowns each serving. If God is in the details, as Mies van der Rohe told us, then this tiny restaurant, elegantly decorated in calming peach and cream tones, is richly blessed. From the almost flawless service through most every dish, strict attention has been paid. From among the appetizers, the standout was a Gruyere-topped French onion soup, which boasted a white-wine broth rich in onions and the meaty flavor of the veal bones from which it was prepared. A close second was a plateful of cheese tortellini large enough to have been a main course; a heart-stopping cream sauce covered the pasta, which had been blended with a few expertly sautéed scallops. There were no complaints about the smoked salmon or the escargot drippings in garlic butter. The Calamari Frito was also good, though it could have been marinated a few hours in milk to take away some of the squids slight rubberiness. If Caesars are not your thing, you might want to consider the almost equally satisfying Warm Spinach salad with Mushrooms. It, to , is prepared table side and features a warm dressing of bacon, mushrooms, vinegar and a touch of brown sugar in which the spinach is lightly sautéed. Spinach also graced a most wonderful Lobster Florentine, chief among the specials one evening. Consider yourself lucky if it’s available when you dine there and forget all other options. The sweet, moist lobster meat was a perfect match for the spinach and the creamy sauce that graced it. Scallops, grilled with lemon butter and parsley or sautéed and served with a beurre blanc, were light and yet deeply satisfying. In fact, all three of these seafood dishes make me want to return to try the grilled trout, which they were out of on the second visit. Beef eaters couldn’t do much better than the Pepper Filet, a tenderloin encrusted in peppercorns and topped with a creamy brandy sauce. It went all too well with the potatoes that evening: they were mashed and came loaded with more cream and cheese than if they had been prepared au gratin. Only the grilled French Lamb Chops, which had a slightly odd aftertaste, failed to make as favorable an impression. Dessert was more mixed. The tiramisu was fine, though not overly inspired. My friends all enjoyed the chocolate cake – an oversized slice of multi-layered cake with a half-dozen types of chocolate – but I found it a tad dry, almost stale. No complaints can be made about the strawberries flambé. This is another dish prepared tableside (you can also have it with bananas), and it’s undeniably fun to watch the server set fire to a heavenly blend of berries sautéed with butter, Grand Marnier, orange juice and brown sugar. More fun, however is devouring this concoction, which is poured over vanilla ice cream. Licking the bowl afterward is probably not a dignified act in a restaurant like Mesón, but you’ll want to do it anyway.